I couldn't begin to tell you the number of times I played each of the four games contained in Mega Man Legacy Collection 2. I know them like the back of my hand or, to put it more intimately, like the face of a life-long friend. These games mean something to me, you know? They mean something to a great many of us (all for different reasons, I'm sure). That's why it was important for Legacy Collection 2 to reproduce these games as faithfully as possible. I'm happy to say it met those expectations. 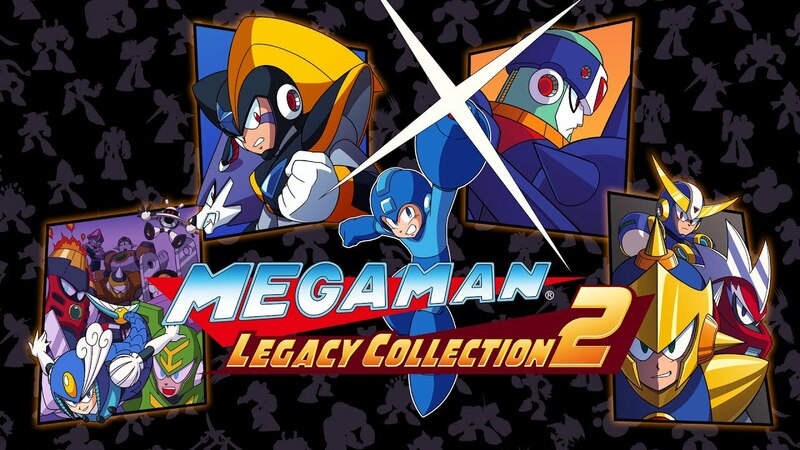 It may not have as many games as Mega Man Legacy Collection 1 or Mega Man Anniversary Collection, but Legacy Collection 2 does a great service to the four games it represents. These conversions of Mega Man 7, Mega Man 8, Mega Man 9 and Mega Man 10 feel exactly the way they should. I experienced no game-breaking bugs or unintended slowdown. You could easily mistake you were playing any of the four games on their original hardware. Controls are responsive, lag-free, and fall nicely to the tune of your muscle memory. If you’re totally new to Mega Man, you can opt to switch on the added "extra armor mode" to take less damage. This can be accessed from the main menu and it applies to all four games. Further, the developers have implemented save checkpoints for easy checkpoint reload. It's a nice addition for new and rusty players alike. In terms of presentation, things are spot-on in nearly every regard. The colors pop, pixels are clean, and load times are essentially non-existent. The games themselves look fantastic. You have three display formats to choose from: "original" (4:3), "full" and "wide". A CRT-like filter can also be toggled. 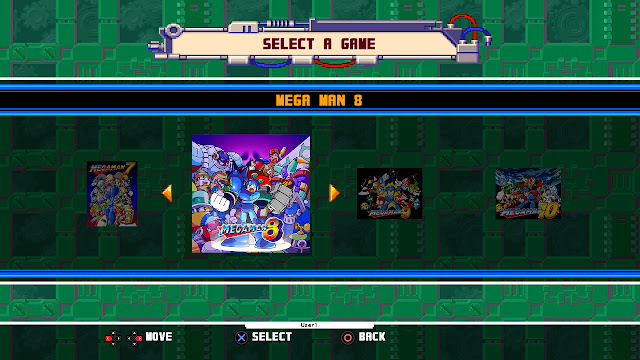 Out of all the games, though, Mega Man 9 and Mega Man 10 look the crispest. I'm happy to confirm the forced blur filter from the PS3 and 360 versions has been removed. Also, before I forget to mention it, Mega Man 7's end credits animation is intact. This is no Anniversary Collection do-over. What is gone, however, are two distinct Nintendo references: the Famicom in Junk Man's stage and the Game Boy that can be found with Rush Search. Not a huge loss but understandable. Audio-wise, everything sounds as it should. Mega Man 9's music and SFX did stutter on rare occasion, though. The first instance was on the title screen. The issue seemed to work itself out shortly. Other than that, the audio presentation is nicely done. Mega Man 8's voices are the clearest I've ever heard them – for better or worse. Speaking of Mega Man 8, I have to talk about the FMVs. I wish they were presented in a higher-definition. They look as fine as they did in 1996 but they're still compressed. I don't know if the original source material was lost or unavailable, but little effort was made to clean these clips up. I also found it a bit odd that the opening FMV does not not immediately play when you boot MM8. To see it, you have to sit through the demo clip that plays when the title screen is left idle. Electrical Communication is a no-show, I'm afraid. Even when you switch the game's language to Japanese, it still plays the English opening theme. A minor annoyance but not a deal breaker. 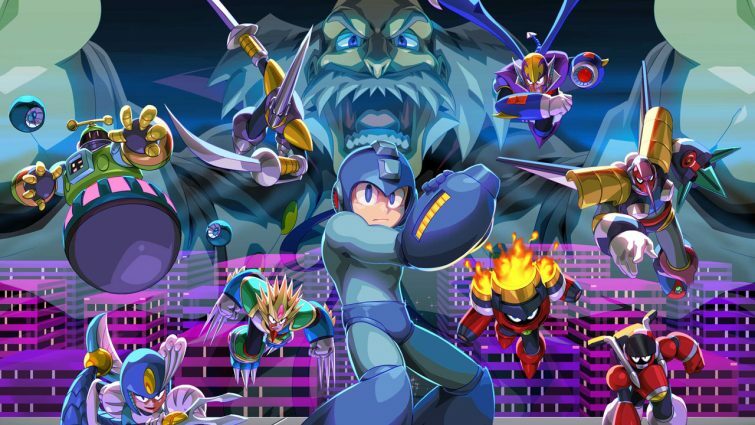 Mega Man Legacy Collection 2's extras add a bit of replay value. Much like Legacy Collection 1, there's new challenges, remixed stages and time trials to test your skills. You can also challenge Robot Masters outside of their respective games to improve your talents or practice. There's 21 Trophies to scoop up, too, which does not include Mega Man 9 or Mega Man 10's original Trophies sets. Instead, those original challenge have been moved to the Extra Challenge menu. Yes, that includes "Mr. Perfect". Mega Man 9 and Mega Man 10 DLC is not available from the start, might I add. You can either beat their respective game to unlock the DLC... or input the following button sequence on the respective game's title screen: Up, Down, Left, Right, Left, Right, Down, Up, Up, Down. You'll hear a chime if it worked! The Museum Mode is bursting with concept art. While most of these pieces can be seen in MM25: Mega Man & Mega Man X Official Complete and past publications, with a few new additions. One piece in particular is a bit of an odd-ball. 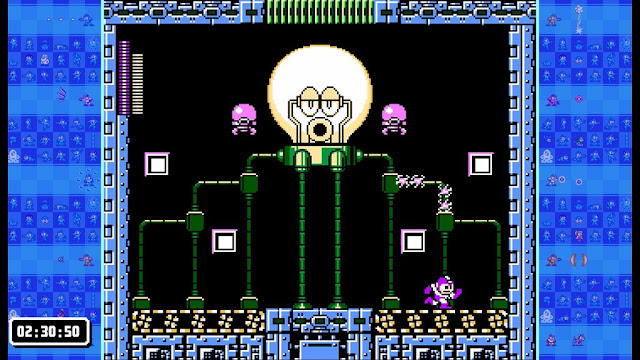 The above image, dubbed "Design Concept " is purportedly from Mega Man 8 but it sure as hell doesn't look like it. It looks like the handiwork of Yuji Ishihara, character designer on Battle Network, Star Force and Legends. 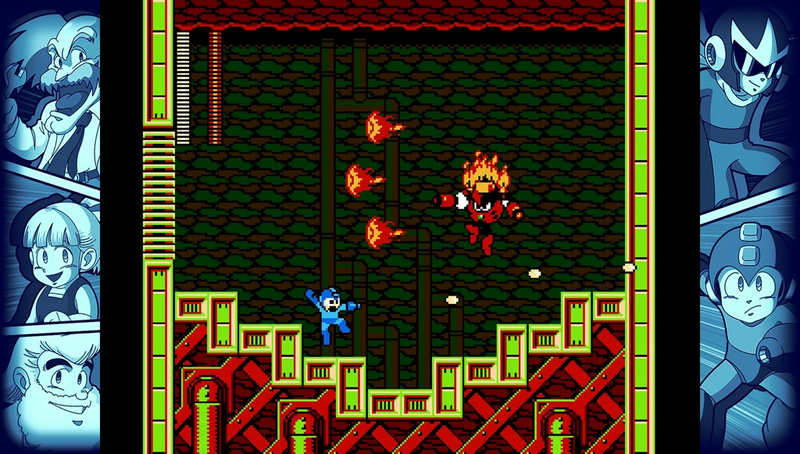 Curiously, Ishihara didn't work on Mega Man 8, let alone any classic series title. I've combed through every resource I know and I've got nothing on it. I think it's new. I mean, did someone accidentally slip some Mega Man 11 art up in here? The details on the torso, feet and arms are reminiscent of Mega Man's Smash Bros. design. The oversized hand may scream Duo, but the whole package looks more a Robot Master power-up. 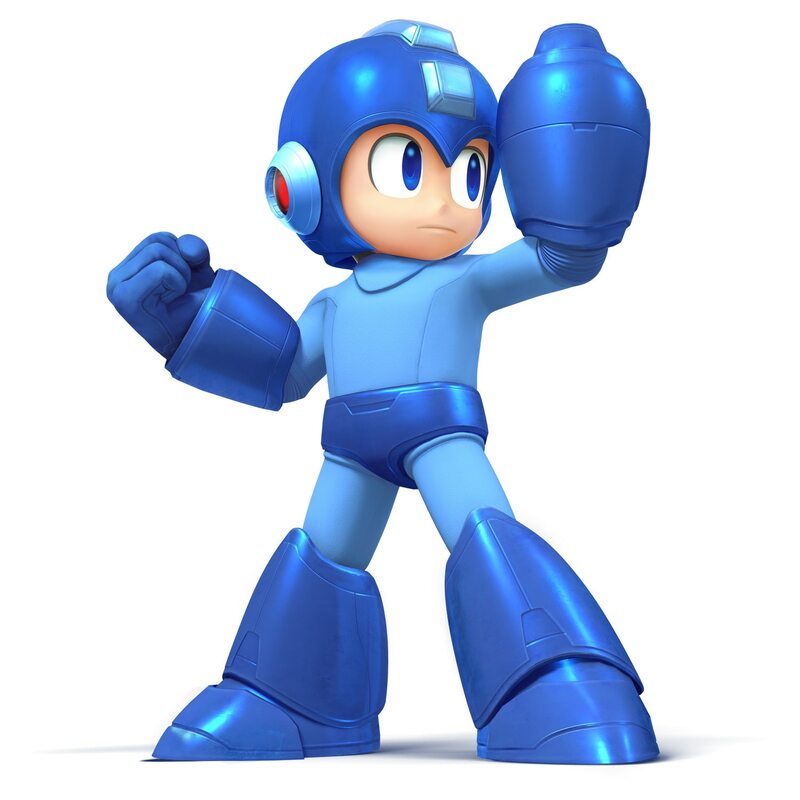 However, classic Mega Man's appearance does not normally change to reflect an equipped Robot Master attribute. What's going on here? Anyway, the Museum Mode is a nice addition but it's lacking. There are far fewer pieces here than Legacy Collection 1. No magazine clippings, promotional posters or anything obscure like that. The image quality isn't quite up to snuff, either. You're given the option to zoom-in for a better look, but what's the use when everything comes up blurry? The resolution needs some serious work. Overall, Mega Man Legacy Collection 2 succeeds in bringing four great games to the current console generation. It is unmistakable that developers Now Production and Bullets Co., Ltd worked to ensure that each game was reproduced as authentic as possible. I only wish these guys had the opportunity to add in Mega Man & Bass, the Saturn version of Mega Man 8, and the Game Boy games. For what Legacy Collection 2 is, though, I gladly recommend it. If I had to score it, I'd give it an 8/10. Mega Man Legacy Collection 2 is now available on PlayStation 4, Xbox One and PC for $19.99. I'm glad that the blur filters in 9 and 10 are gone. Did the Wii versions have the blur filters too? It's been so long since I played them. Nope no filter on the Wii version. Did they run at 240p when the Wii was attached to a CRT television set? Leaderboards. Specifically the Mega Man 9/10 ones. Are they functional? And, if so... are they cross-platform? They're there. Don't know about cross-platform. Does that mean you can play Mega Man 8 with the Japanese voices in tact? You can! You can switch the language in the options menu. You can't, though, have Japanese voices with english text. It's one or the other. Wow, I'm amazed they managed to get the rights to the Japanese voices for MM8. That's quite a feat, especially with the attitudes most voice studios have had these past several years about letting their voice cast's audio leave their soil. We'll also get to hear Taekshi Aono (rest his soul) voice Dr. Wily, so there's something. does the password to start with all 8 robot masters work for MM 7? I do not own the game, you should provide the codes so they can test them for you. Nope, not me. I don't know if I'm entering it too slowly, but I'm also not sure how much faster it could be entered. I also noticed that if you re-map something to the touch pad button on PS4 for MM7 it becomes impossible to visit Auto's shop; the PS4 touch pad is assigned to an unlisted button function which can't be reassigned in the menu. Worked fine for me:/ just entered at quicker speed. Think like doing classic MK Fatatlies or classic cheats. That speed of button presses. I used the one on capcoms page and it worked. Ah, no wonder. He left out an input. It's Up, Down, Left, Right, Left, Right, Down, Up, Up, Down. Unless you mean a Japanese version of Mega Man 8 on PS1, you won't have any luck. Rockman Classics Collection 2 also has the song removed and replaced with the overseas version. I need to know more about that "Mega Man 8"Artwork. That is suspicious AF. Does that concept art match anything else seen in the Mega Man 9 or 10 galleries, style-wise? Looks like it could have been something relating to Concrete Man, if anything. But I'm leaning more towards this as a subtle tease for something to come. I've been reading all the comments on your twitter posts. I hate to be hype, but I am hype lol. December 17th of this year is his 30th Anniversary, after all. Nothing similar to it in 9 or 10. I also have 3 classic series related artbooks and nothing of the sort was in any of them. Notice the color on the armor is similar to that Design Concept , well not exactly. 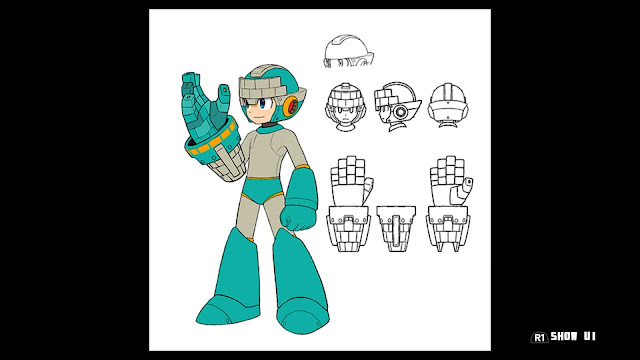 But Mega Man's ear pads on that Design Concept  is so Battle Network-ish. Maybe it is an enforced art for MM8 because lack of material or maybe it is really a concept for Mega Man 11 (similar to Mighty Beck's weapon ability). I score it a 0/10 for no 3DS or Switch version! I wanted a switch version as well but don't ya think thats going a bit far? I wanted a physical copy of 9 and 10 for the longest time. And hey... Atleast we got the Gunvolt port to look forward too. Did a certain letter M in Bass's dialogue in Shade Man's stage get changed to an R like in the Anniversary Collection? Crazy enough they didn't take out the giant Famicoms in Junk Man's stage back in the old Anniversary Collection even on the PS2 version, but they change their minds now? Maybe Nintendo didn't care back then because the collection was exclusive to consoles only and the Legacy Collection 2 is on PC, Nintendo's worst enemy? Do you know if there's a way to still get the PS4 theme if I didn´t pre-ordered it digitally?